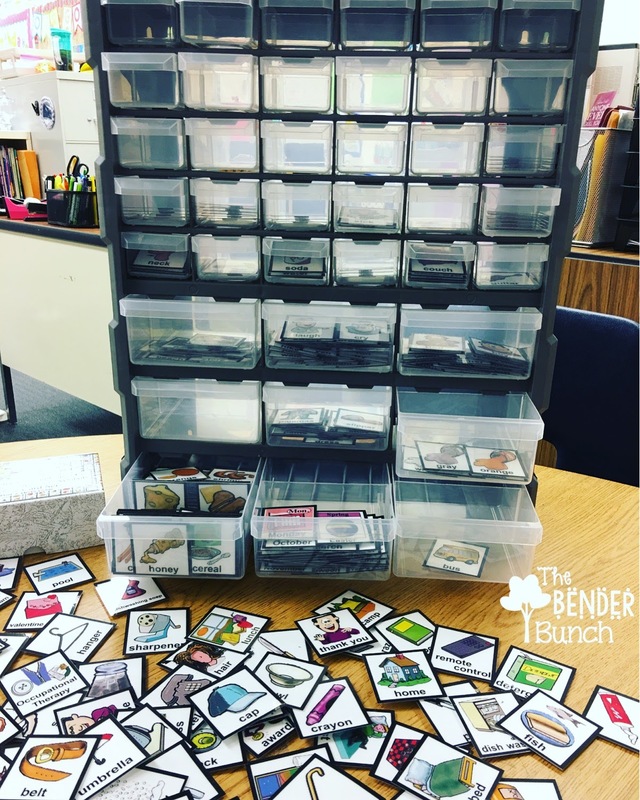 The Bender Bunch: PECS Storage System & Giveaway! 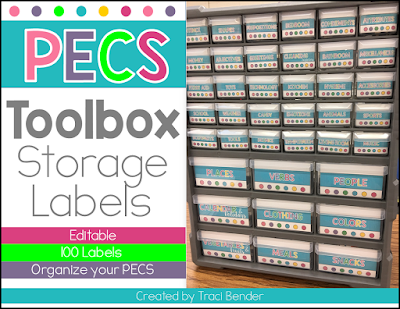 PECS Storage System & Giveaway! Hi friends! I'm dropping in briefly today to show you how I organize my PECS using a toolbox from my local hardware store...AND to offer you a giveaway opportunity! This is the toolbox that I use. It is a 39-drawer toolbox and you can find it from Ace Hardware here. Other sizes could work too, but I like this one due to it having both large and small sized drawers. Some of our more frequently used PECS require larger drawers, and this toolbox is very deep, so even the small drawers store alot of pictures and also have a divider in each allowing you two sections if needed. The PECS you see in the picture above are from this set. I highly recommend this purchase if you are just starting PECS. You will have just about every symbol you could imagine right at your fingertips without the stress of having to create symbols you find you need as you go or worrying about what program you will need to create them. 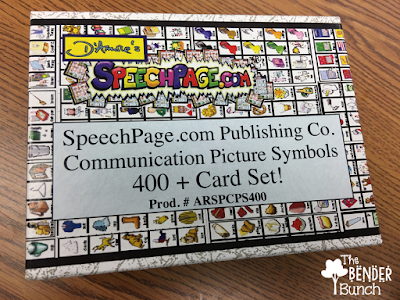 While I do occasionally still need to make a symbol from "Smarty Symbols" or "Symbol Stix," this set has been a major timesaver and is worth every penny. 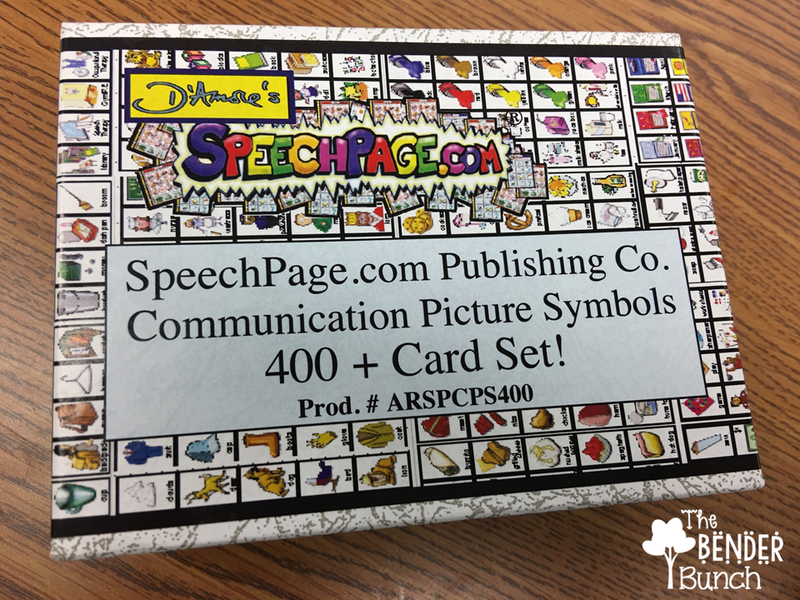 The symbols are all pre-cut and ready to use! You can find this symbol set here and it is currently $15 off!! Here is a close up look. 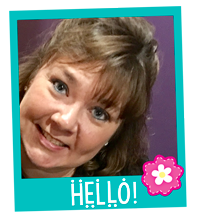 I just love this system and I know you will too! I've tried binders with trading card pockets, hanging plastic shoe pockets, and cigar boxes even! This is the first system that has worked well and lets me easily retrieve my PECS easily and quickly as I need them! If you're interested in the PECS Toolbox labels they are available here, but don't go anywhere just yet! I'm giving away one 39-drawer toolbox just like this one, to one lucky winner and I'm even throwing in a bonus! You'll also receive a set of my labels for FREE! To enter, just pin the image below or pin from here and leave your pin URL in the comments! I'll choose a winner this weekend! I LOVE your PECS storage system! You are always so organized! Thank you so much for sharing and for the giveaway! I pinned it! I'm a new teacher, so this is amazing! First of all, thank you for keeping me motivated during the summer for my precious students. I was reading your blog post about the giveaway but I could not enter because I don’t have a blog or Google Account. I tried to list my Pinterest link but it would let me complete it. Can you email me with suggestions at beth_squirt@hotmail.com ? I would love to win this toolbox. Great blog and great storage solution for PECS. I NEED this in my life!!! You are always so inspiring. Thanks for the opportunity! this would be so, so helpful as I start my first year teaching!!! thanks for the opportunity! I would love to win this organizer! I started using PECS last year and it has been so beneficial for my students!!! Such a great storage solution! Such a great idea!! I'd love to have something like this!! This is my summer goal!! This is amazing!! Thanks for sharing this awesome idea! I would love this! 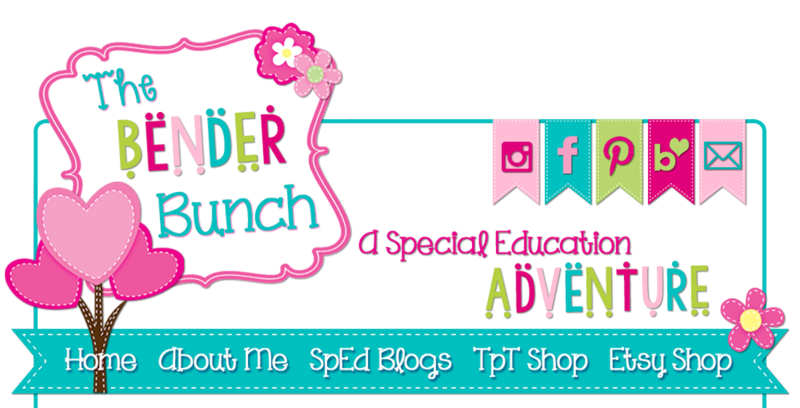 I am going on my 11th year teaching and my first year in SPED. 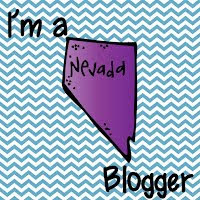 I am really excited for the next adventure and have loved reading your blog these past few weeks! Thank you for all of your tips and advice! Oh my gosh, I absolutely love this! Love this idea! I just started a new program at a new school in my district and my organization was not the greatest last year. 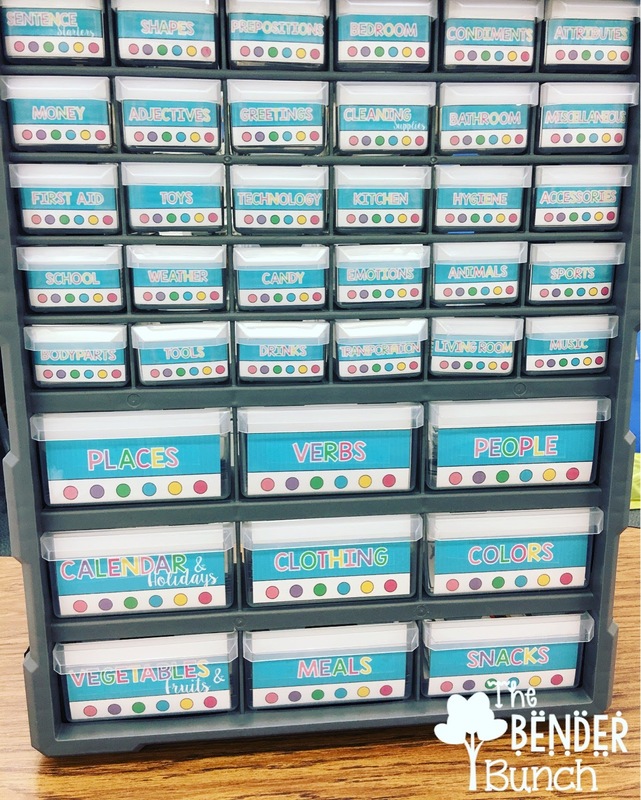 This definitely would help with getting my PECS organized and ready for my upcoming students. My pecs are always everywhere or get lost when I need them. I love the organization, this will be a much needed and appreciated addition to my classroom making the pecs accessible but the entire team!!! What a nifty idea! I've pinned on Pinterest! Thanks for the opportunity to win BIG! Pinned! Organizing my multiple bags/drawers full of visuals is my next summer project....as soon as I finish all the file folder tasks and task boxes! OMG, This is amazing! Thank you for giving it away. I have a similar system for my schedule pieces, but really need to do this for my pecs as well. I have so many and feel like they are all over the place. 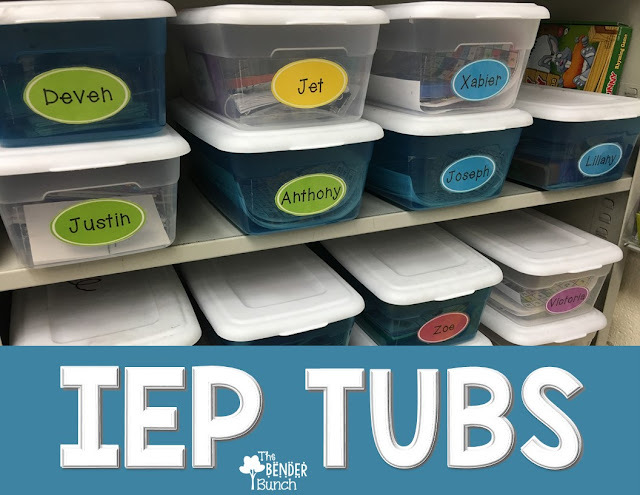 Summer Organization Project! As a first year SpEd teacher, this sure would come in handy for my nonverbal kiddos!! Genius! I need to get my drawer full of PEC symbols whipped into shape before school starts in a month! Would love to use this!!! 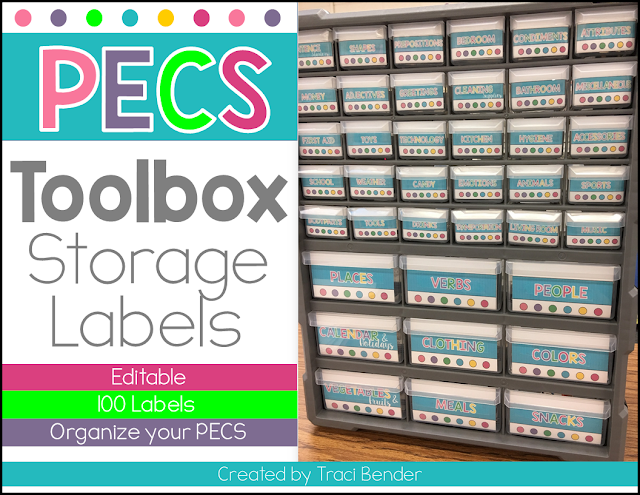 I wanted to enter for the storage bin and label giveaway. I have been following you and love everything. My email is tluis@rcoe.us or teresaluis72865@gmail.com. Not sure how to pin it. Thanks for the giveaway opportunity! Great storage idea.